This is a Picture of a 'Ghost', taken at Greenwich at the Queens house on the tulip staircase. Photo was taken by Brian Tremain of National Maritime Museum. He tries to reduce the effect on the picture. ...not outside them. See these photos of the Tulip Staircase. The minister's photo was taken from below the staircase looking up, and the "stairs" you are seeing are actually the underside of the staircase. That is why they seem rounded instead of squared off. At the time the minister took the photograph, the stairs were closed, and no one could have been on them -- they date back to the 1600s, are fragile, and were roped off. This page also has a better copy of the minister's "ghost photo". 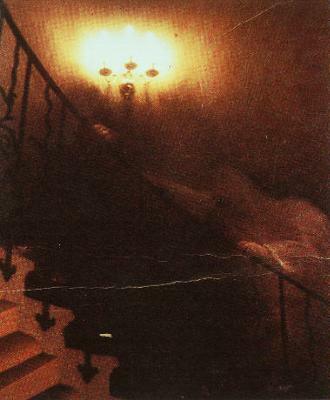 The photo is just taken from an extremely odd angle -- this is why the ghost appears to be hanging off the outside of the staircase, rather than walking on the actual stairs. I have it in one of my ghost and ghoul books about 3 years ago, it's a really old picture and there is a second one with the ghostly figure further up the stairs. Sooo freaky. As soon as I saw it I was freaked out. The original photo is very dark and larger than the cropped (and retouched) version you see here. Some commentors have remarked that this is a painting, not a photo -- unfortunately, many ghost book collections have printed a retouched version of the original photo instead of the photo itself, so you are correct -- the details of the figure are painted. In the original photo, the hood is not so clear -- mostly you just see the hands on the railing. Some speculate that the upper hand does not belong to the hooded figure you see, but to another apparition above it, not visible in the picture. The photo is not faked, and it was taken by a retired Vancouver clergyman on a visit to England. Upon his return, his grandson Mike showed me an original print - he brought it to school - back in the mid 60s. The print I saw was clearer than this, and the hands were amazingly clear. Kodak experts were unable to find any evidence of tampering with the negative. Is it a ghost? I can't say, but it's a stunning image. Man that one's cool, looks kind of like the grim reaper free running and about to climb the railing. Awesome! Again, this is not a photograph. You can make up any history you'd like, but it doesn't change the fact its an illustration. You people who think the ghost is on the outside of the staircase. The view of the stairs you are seeing is the UNDERSIDE of the risers. Google the staircase and take a look at some daylight pictures of it to get yourself aligned. Then look back at this picture. This is a very famous staircase; if this picture is fake, it's not because the staircase can't exist. "Rev. Ralph Hardy, a retired clergyman from White Rock, British Columbia, took this now-famous photograph in 1966. He intended merely to photograph the elegant spiral staircase (known as the "Tulip Staircase") in the Queen's House section of the National Maritime Museum in Greenwich, England. Upon development, however, the photo revealed a shrouded figure climbing the stairs, seeming to hold the railing with both hands. Experts, including some from Kodak, who examined the original negative concluded that it had not been tampered with. It's been said that unexplained figures have been seen on occasion in the vicinity of the staircase, and unexplained footsteps have also been heard." The right hand has a ring on its finger but it is not his real finger so what is it? How did he die? Why is he wearing a hoody and what is he doing there? Did he live there or a servant for someone or was it his friend's house? The 2 hands that you see on the railing are both left hands. The upper hand is where the "ghost" grabbed the railing for the second time while ascending the stairs during this time-lapse photo, besides, have you ever tried to walk up a flight of stair while trying to hold on to the railing with both hands? It is an incredibly artistic photo and thats why its so famous. I'm a professional photographer and also trained as a forensic evidence photographer and I've "fabricated" many incredible ghost photos for the sake of art but refuse to pass my stuff off as real. and by the way, I do believe in them and have had many experiences, BUT SO FAR, have never photographed a real one. I can't remember the book. It was a collection of ghost stories published in the 70's. Anyway, this illustration was in it. Its an oil painting on canvas. Look closely and you can even see the texture. I remember it because it really is haunting. Often, ghosts are caught in the last moments of their death. This one seems to either be running from, or chasing after something/some one. This is a singular image insofar as it captures a true quantum/ psychic event. A sleeping dreamer occupies the exact position and "experiences" the vague, half-conscious sentinence of the cowled figure in the photograph, but not necessarily at the moment the photo was taken. True time, as opposed to the temporal grid of duration that we experience, is something in which every event thas ever occured and ever will occur is happening simultaneously. How many times have you dreamt of struggling with a seemingly innocuous obstacle (such as a staircase) with the feeling of getting nowhere, but everywhere at once? Could this be YOU?!? This is a singular image insofar as it captures a true quantum/ psychic event. A sleeping dreamer occupies the exact position and "experiences" the vague, half-conscious sentinence of the cowled figure in the photograph, but necessarily at the moment the photo was taken. True time, as opposed to the temporal grid of duration that we experience, is something in which every event thas ever occured and ever will occur is happening simultaneously. What can I say? I don't have the words. Beautifully done! You know when you are really tired and have to drag yourself up the stairs? Thats what this picture looks like. Lower on the banister is a hand and another stretch out and up as if someone is stretching and leaning. Looking at the color it looks like a Renaissance painting of a person stretched and maybe toyed with via photo shop perhaps? How can you not see anything? What a nice pic! This is so cool!!!! This picture is so creepy!!! But it's very interesting! Thanks for this historical pic!